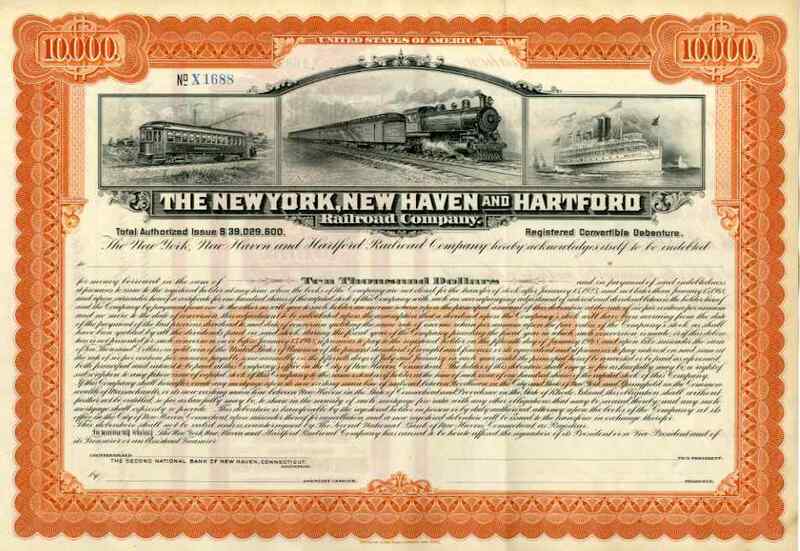 1923 New York New Haven & Hartford RR $10,000 Bond Certificate. Very attractive unissued registered scripophily bond, with detailed vignettes of a long electric trolley car, a steam locomotive pulling passenger train, and a 2 deck 2 stack passenger liner. The New York New Haven & Hartford Railroad started in 1872 when the New York & New Haven RR merged with the Hartford & New Haven RR. Over the years it leased many other lines, eventually forming a virtual monopoly in Southern New England. VF+ condition.